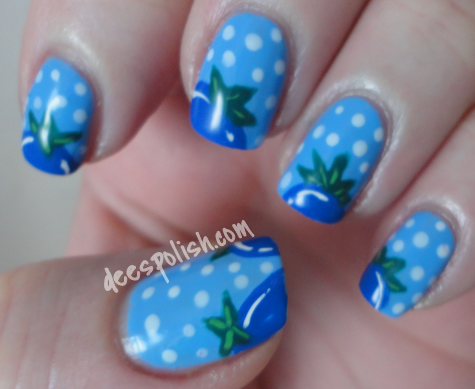 Day 5 of the #31DC2014 orders blue polish to be used.. All right! Green is my favourite irl colour, and I do love me some green polish (all the green!) but blue has to be my favourite polish colour, I find that no matter the shade, it compliments my skin tone. But. What to do on my nails? I found THIS image, but could not find a source, any know who did these gems? Anyways, using that photo as my guide, I got to work. I started off with a base of Barry M Blueberry (how fitting) on each nail. 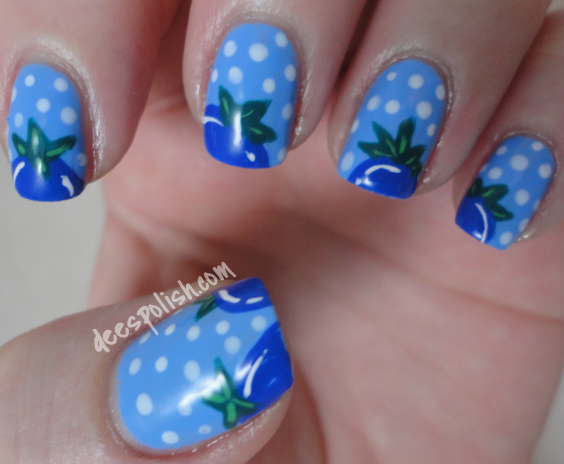 I then drew some half-blueberries on the tips of my nails.. they actually remind me of blue tomatoes, but I want you to be thinking blueberries! Anyways. I used China Glaze I Sea The Point to do that. Then I added some highlight with FxFS White Matter. I then added the little stem.. actually.. this is probably why I am thinking tomato.. I started with OPI Amazon...Amazoff and did some highlighting with Essie Mojito Madness. When I was all done with the berries.. I knew my nails were not done.. right! I always feel like dots add the finished touch. These nails were no different. I used China Glaze New Birth for the dots. Now they felt complete.